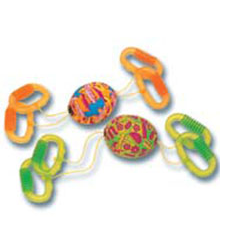 A Zipper Ball toy, which helps kids with motor coordination. 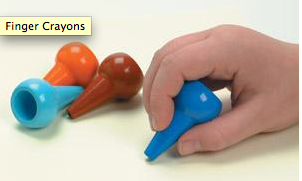 You hold one end, your kid grabs the other and you slide the balls back and forth. Finger crayons: The bulbs are much simpler to grasp than regular crayons. Totlol: a YouTube-like site for kids. DLTK's Crafts for Kids: has free printable pages for coloring and crafts. If you've found any great stuff your kids have been loving, share! My mother is a "sewer" (when I look at that word, I just go GAAAHHHH! !--I don't mean the thing full of poops, I mean a person who is handy with needle/thread!!!). Anyway, she makes the BEST puppets out of bargain sweat socks from the Walmart. She dyes them (if the character is blue or green or yellow or whatever), she uses yarn for the hair (sometimes she'll knit a little "hairstyle" and sew it on), she embroiders the eyes and nose and mouth, she makes little outfits for them that she stitches onto the puppets, and she modifies them so that they fit the kids' hands really well and they use the hand to make the puppet talk--they're little works of art, and all made from scraps and leftovers (except the socks--she gets those new). Anytime the kids have a new "hero" she makes them a couple of sweatsock puppets of their favorite (there have to be two of the same character, so they don't get jealous). We strongly encourage a puppet for each hand when they play, so Buster uses his weaker arm to make one puppet talk. In order to do this, though, you need a momma who can sew! I just never got good at it like she is; I can do it but the detail in her little toys is just amazing. Plus, they're loaded with Grammy-goodness, which is the best part of all! 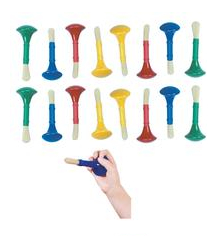 We have a lot of these things at our house and I have to say I LOVE the finger crayons. Daniel started off using them buy palming them, now he sticks his little finger in them to get more control. I love them! Faith's OT made this really cool cheap thing for her to color with. She used some hollow foam tubing about the size for a child to grasp, then she slit a hole in one side and stuck a broken crayon into it. So Faith can hold it, using her horizonal grasp and color on paper. Also we really like those Crayola crayons that look like little animals b/c she can grasp them too. Oh, my latest FAVORITE thing. We use lots of flashcards/pictures for Faith to learn to id. So we bought her a small HP digital photo frame. It was $20 on ebay and it holds 45 pics by itself and unlimited w/ an SD card. It's a 3 1/2 in. model, so she can see it. We take our camera everywhere and just snap a pic of a new thing and upload it to her frame. She LOVES it, b/c you can do slideshows, random orders and set it to automatically turn off! We found it originally at Best Buy for $55! Plus it's pretty sturdy, she has thrown it a bunch of times but nothing has broken. It also has a rechargeable battery! We've been enjoying a cool website: letteroftheweek.com. This lady has done all of the gruntwork.. you just click and go. No, I do not plan to homeschool, but I enjoy having something stimulating for the kids and we do 2 weeks instead of 1! She gives you song ideas to go with each week's themes, printable color or paint pages, books to get from the library.. you name it. Looks cheesy at first, but very very helpful and fun. Ooh, thanks for the great ideas, guys. Long weekend coming up, I'll have time to do! Sabrina's not starting school till the following week, only Max starts post Labor day, so it's not doubly crazy (just one-kid so). W just used the zipper ball in OT last week. Not a favorite, as the clacking when it gets to her end scares her. The finger crayons, her school OT said that our daughter is the only client she has, that actually does super with them. Going into 4th grade now, we have moved on to Twistable crayons. Can get some $1 a pack at a dollar store. We get the Crayola kind for quality though. Crayola also makes Write Start colored Pencils also, and these are one of the school favorites. This year we have also added erasable colored pencils with pencil grips on them to our arsenal. For speech difficulties, take a look at www.proloquo2go.com This is an awesome app for your iphone or itouch ipod. Those simple scissors made with the little lever to help them open backup are very cheap and useful. The "special ones" with the springs in them, cost $18. So we use the cheap $1 ones, and it practically does the same thing. For keyboarding/writing help, check out Intellikeys (www.intellitools.com), Co:Writer (Don Johnston), and TestTalker (Freedom Scientific). Hope I gave everyone some new ideas.